It was over a year ago that I started playing the 3DS version of Dragon Quest VII, and now I’m finished. Well, finished the main game, anyway. I know there’s some bonus post-game content, like a dungeon where you can fight God; and I never finished with Monster Meadows. Really, though, I’m a little anxious to move on to something new. This game is long, which isn’t a problem in and of itself; it’s more bang for your buck. Get it? Because there’s a spell called Bang in the series? Still, it can get a bit overly complicated and tedious at times. I already mentioned how much of it consists of going back in time to restore various places, and while each of them has their own traits, it can be hard to remember which is which when you have to return to one of them for some reason. You don’t always visit the places in the past in the same time period, and some characters reappear in a few different quests. You see Greenthumb Gardens on two occasions thirty years apart, the torban player Florin becomes an old man by the second time you encounter him, and you complete the Providence scenario before the Vogograd one even though the latter occurs earlier in time. Speaking of time, the town of El Ciclo is stuck repeating the same day over and over again, which is interesting considering that, in games like this, the townspeople always say and do the same things unless they’re involved in a major plot point, so in many ways it doesn’t even seem that different. The problem is that a bridge is supposed to open the next day, and this won’t happen until you defeat the monster who’s causing the time loop. After restoring the world, you have to defeat the Demon King Orgodemir in the past, then help the Roamers revive God in the present. It doesn’t take a Seed of Wisdom to realize something is wrong, though, especially after God seals off several parts of the world again and brings monsters back to the overworld. He also bans the use of weapons, never a good thing in a game centered around fighting monsters. I’m surprised Republicans haven’t yet used this as an argument against gun control. Really, though, it’s hard to get a consistent message about such things. You can sort of see a theme against seeking too much power, as with the magical town of Hubble almost bringing about its own destruction and changing to focus on music instead; but your characters are certainly encouraged to build up their magical powers. There are three other regular party members besides the ones you start with: Ruff, a wolf cub magically turned into a human; Sir Mervyn, the ancient paladin and chosen companion of God in his battle against the Demon King; and Aishe, a strong fighter who’s been trained as a dancer, and turns out to be descended from Kiefer after he leaves the party. The quest to recruit Mervyn is especially involved, as you have to seek help from the richest man in the world (whose main mansion you can’t reach until you have the flying carpet) and climb the tallest tower in the world in order to free him. Being an old and out-of-place knight, he reminds me of Sir Hokus of Pokes from the Oz series. 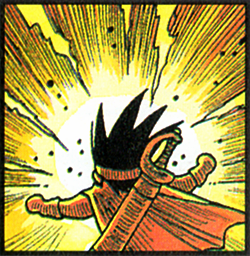 I recall him starting out a bit weak for that point in the game, too, although it’s not that difficult to build him up. The job system allows anyone to master any skills, but the characters remain stronger in some respects than others, and the weapons they can equip depends on the character rather than their job. Unlike in the PS version, you don’t keep all the skills you learned from one vocation upon changing to another, although you do retain some. As such, they don’t get overpowered as easily. I do like how you can max out a job, though, as it’s a convenient milestone to use, especially as it seems like normal leveling up is really slow in this game. When there’s no endpoint, it’s more difficult to know when to switch. 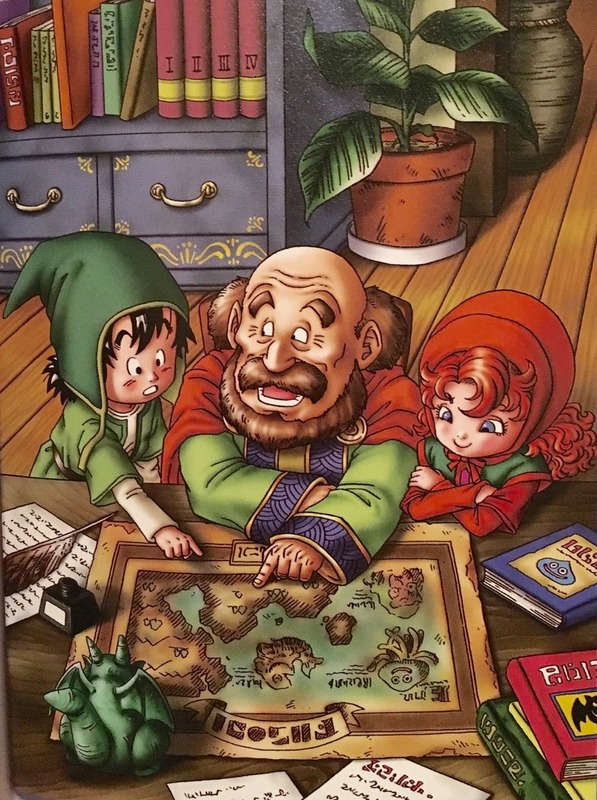 Anyway, I felt that the heroes received less respect than is common in DQ games, with non-playable characters liable to think of them as just kids. In fairness, the characters you start with do act quite young and inexperienced, and it’s difficult for your fame to proceed you when most parts of the world are cut off from each other. As a villain, Orgodemir doesn’t really have much of a motivation or personality, or at least we don’t find out a whole lot about them. That’s common for the main villains in DQ games, although after some rather more complex characterization for Psaro in DQ4, it’s a little disappointing that they went back to mysterious ciphers in later installments. Like Angra Mainyu from Zoroastrianism and some conceptions of Satan, he opposes God and seeks to destroy creation just because it’s what he does. And this God, while powerful, hardly seems to be omnipotent. I mean, why would you need a ritual to revive the Almighty when he’s supposed to be, you know, almighty? But I don’t expect a video game to necessarily address theodicy that directly. Anyway, Orgodemir (Orogu-Demira in Japanese, so “God” being part of his name was presumably a coincidence, although I’m sure someone noticed it) must have a lot of power to seal off entire continents like that, but in the end he can be destroyed by being stabbed enough times. 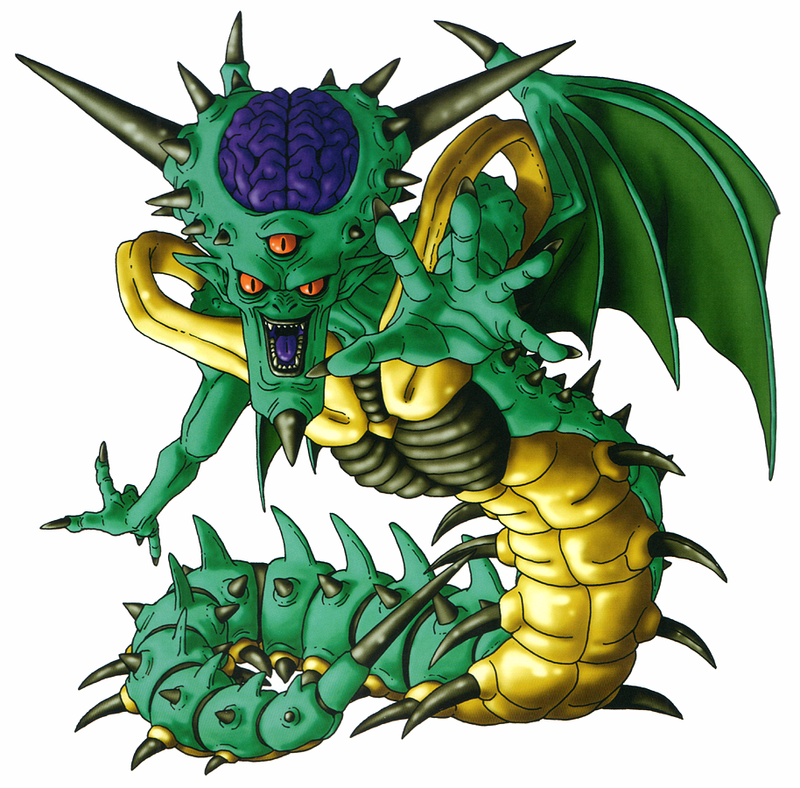 In appearance, the Demon King is sort of a cross between a dragon and a centipede, with a giant head, three eyes, and an exposed brain. 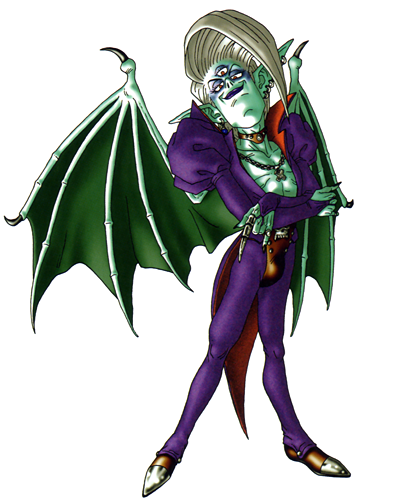 The big boss having multiple forms is only to be expected, but it’s strange that one of Orgodemir’s is a rather flamboyant humanoid one in tight clothes, sort of David Bowie with three eyes and large green wings. After you finally vanquish this foe, the ending sequence has the Skystone automatically transport you to several locations where the people congratulate you and some plot threads are resolved. It’s a tradition in this series to be able to explore a bit after you’ve won and see what people might have to say, but it can be rather tedious trying to find the few who DO have something to say beyond a general message of thanks. The automatic transportation here streamlines this a bit. 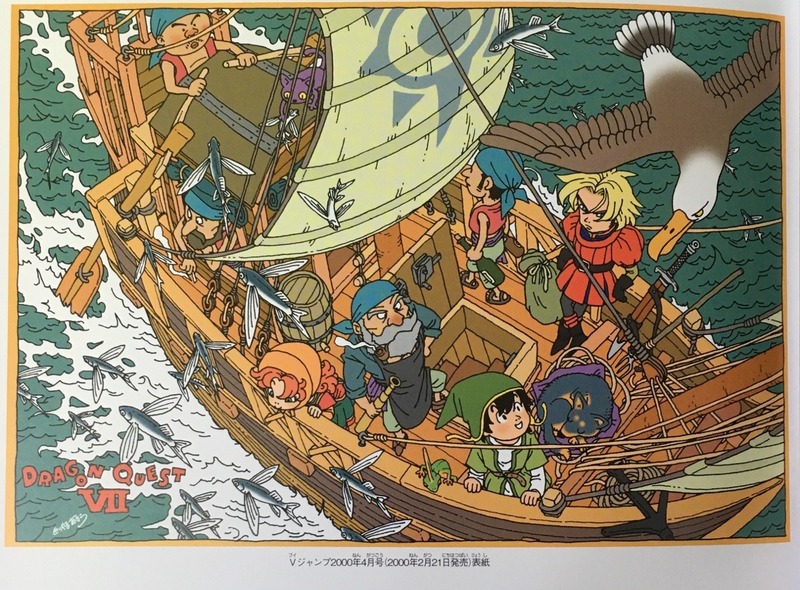 Then the hero finally goes out on a fishing trip with his father, marking his coming of age, even though you’d think he’d have already accomplished that multiple times over by saving the world. But then, he’s a little young to retire, so why not continue to be a productive member of society? It also comes back to the whole thing about your starting characters needing to mature. 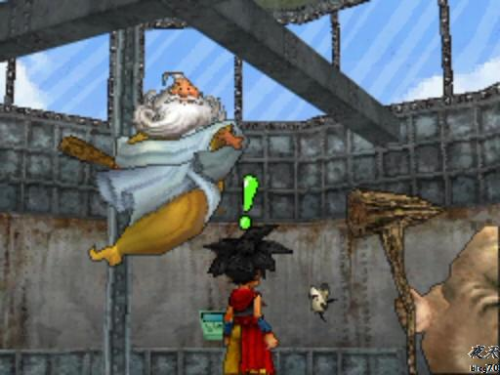 I played the very beginning of DQ8 after finishing this one, and it was a pretty different experience. There’s voice acting, movement is no longer strictly based on an overhead view, and it starts in media res with your hero already traveling the world with companions. I’ve also played a bit of the remastered version of Day of the Tentacle on PC, so I’m not sure which game I’ll write about first. I’ve gotten into the habit of writing about a game after playing enough of it to get a general impression, then again when I’ve won or at least come as close to winning as I’m going to attempt for a while. I’m not always sure when is a good time to do the former, though. 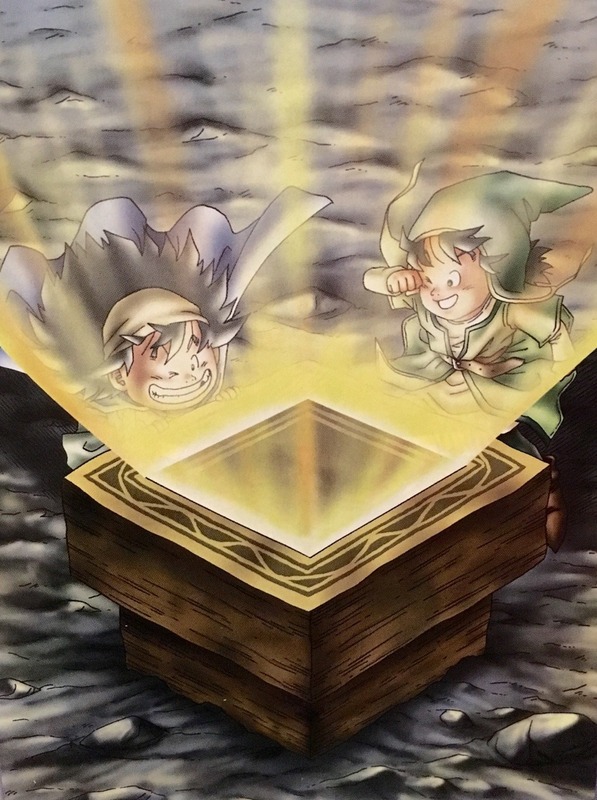 This entry was posted in Dragon Quest, Focus on the Foes, Magic, Monsters, Video Games and tagged aishe, demons, dragon quest vii, florin, fragments of the forgotten past, orgodemir, prince kiefer of estard, psaro, roamers, ruff, sir mervyn, time travel. Bookmark the permalink. There’s a secret little easter egg hidden in the final boss’s name: If you go by the romanization of it as “Orgo Demira”, then you can see it as an rearrangement of “Demiorgos”, the demiurge, the concept of an omnipotent being that created the world, and Orgo Demira is an inversion of that: instead of making the world, he UNmakes it, splitting it up into a dozen little fragments and then sealing them away so they can never be made whole again. That does make sense. To the Gnostics, the Demiurge was a flawed being who created the material world, but the term simply meant “creator” prior to that.